In essence, a bioluminescent bay (or biobay) is a rare and fragile ecosystem. 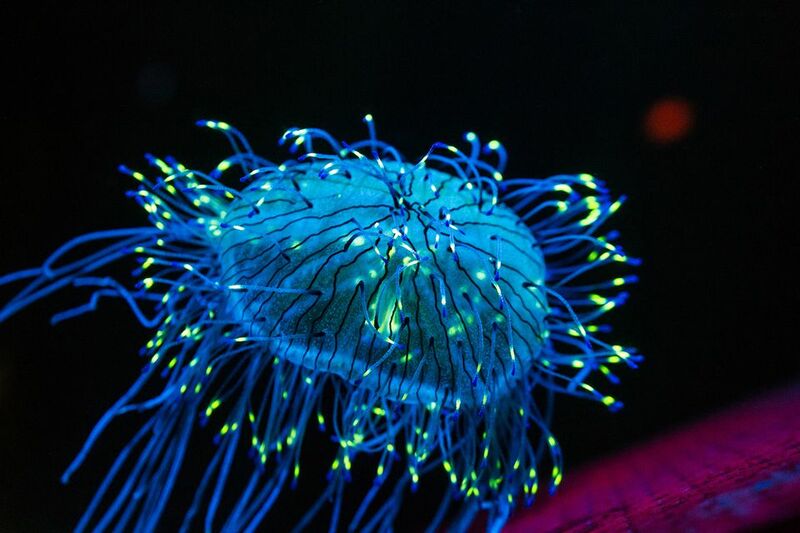 There is bioluminescence all over the world, but few places classify as a biobay. Biobays are formed by microscopic single-cell organisms called dinoflagellates. When these little guys get agitated (i.e. when any object in the water comes splashing through), they release energy in the form of light. That is, they glow. And when they glow, so does anything that comes in contact with them, like fish, the oars of a canoe, or people. There are many reasons why Mosquito Bay is one of the most bioluminescent bays in the world. The bay has a very narrow opening to the sea, which offers excellent protection from winds and tides and lets the dinoflagellates thrive in a calm environment. There are over 700,000 of the organisms per gallon of water; no other biobay comes close to this concentration. Also, the mangroves here are a vital source of nutrients for the organisms, and the temperate climate helps. Finally, man has helped out the dinoflagellates. Mosquito Bay has been preserved and protected; motor boats are not allowed in these waters. For a long time, tourists were encouraged to throw themselves into the water and literally glow in the dark, as the dinoflagellates spark into action whenever they come into contact with swimmers. It used to be a breathtaking experience, but now conservationists are beginning to exercise caution. Even if you don't go swimming, though, you will see darting fish appearing like streaks of lightning, the oars of your canoe dipping in the water and coming out dripping neon green, and your hand glowing bright green when you dip it in the water. It's a beautiful, ethereal experience. It used to be thought that the interaction between man and dinoflagellate was not harmful to either. Alas, conservationists now believe the oil from our skin might be harmful to the little guys. For this reason, jumping in the water is slowly being phased out. There are only two ways to enter the biobay; by kayak and by electric pontoon boat. The kayak ride is a great way to experience the bay's mangrove tunnels and the full splendor of a nighttime excursion, but it can be taxing. For those who don't have the stomach or the will for it, the pontoon boat is a much more relaxed means to visit the bay. For Kayaking, we recommend Abe's biobay tour and Island Adventures. If you can, try to go when it's a new moon. A black night dotted with stars makes for ideal conditions. If it starts raining, don't curse your luck. The raindrops on the water will look like emeralds skipping along the surface.